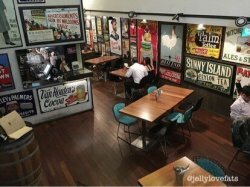 Mr Punch Public house, a gastropub along Seah street, was a relaxing place for friends gathering or after-work chillax. 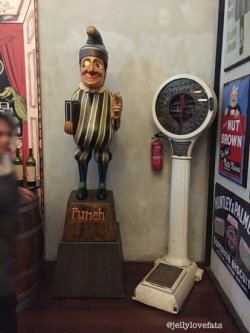 Well known for its violent puppet show, "Punch & Judy" since 16th century, this gastrobar was decorated with great memories of Mr Punch, displaying puppet figurines, statues and vintage posters throughout the space. As the owner loves toys too, the Mint Museum of Toys connecting to Mr Punch Public House showcases 5 levels of his personal toys' collections from all over the world. From vintage to present, I find myself back to childhood! Indeed it's an eye opener for all!! Other than toys, Mr Punch introduced new food concept plus drinks menus such as sharing platters and punch jars to increase the awesomeness experiences for all customers. For a start, we ordered the new appetizers' platter. Mix & Match any 3 items for $35.00* (*premium items incurred additional charges) There's total of 8 items for us to choose from. - For drinks sharing, it's most ideal to order a punch jar. There's two punch jars available for ordering; The servant & The skeleton. We chose the first. Live bands available on every Friday too, featuring local talents. 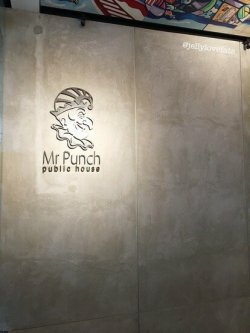 Mr Punch Public House is a gastropub along Seah Street. In fact, most wouldn't notice it since it is at the basement of Mint Museum of Toys, a privately owned museum. Enter via level one of the toys museum and on the left one should spot a stairs leading to the basement where Mr Punch Public House Gastropub is. As I arrived at the restaurant, I was surprised to find the eclectic design. I somehow felt I was at a circle. The space is pretty small and cosy. At Mr Punch Public House Gastropub, they encourage communal dinning as such they offer quite a number of sharing items with Sharing Platters, Bar Bites and Desserts. Should diners prefer individual plate, they could go for the Mains. 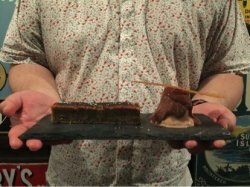 First is the Bar Bites, Mr Punch Public House offers 8 dishes under this category. We tried only 2 of the Chef Recommendation, the Teriyaki Charred Squid ($12) and Potato Chip Chicken ($12). It was a tie. Half the diners prefer the former while the remaining prefer the latter, I belong to this group. A pity that they used chicken breast for the dish. 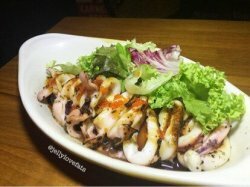 The Teriyaki Charred Squid was pretty well grilled, since we could savour the char fragrance. The sauce could be improved as the version we had was more of a soy like sauce. Likewise at the Platters section, there are 8 items. Diners could choose 3 items for $35. We went for Chicken Thigh Roulade, Custard-Battered Squid Rings and Fresh Mozzarella Cheese. I am glad that the Thigh meat is used for the Chicken Roulade. It is rolled with Feyel foie gras mousse. 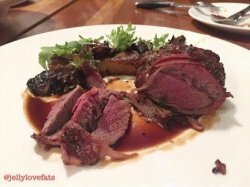 It is really a pity that they didn't use the 'real' foie gras. We love the Custard-Battered Squid Rings best. After deep frying with the battered coated squid rings, these were glazed with marmite. For those who love cheese, would find the simple Fresh Mozzrella Cheese a delight too. The fresh mozzarella cheese is sat on pesto sauce lined on papadum and topped with wildd rocket. We tried only the Herb-Crusted Barramundi ($29) among the 3 chef recommendation. 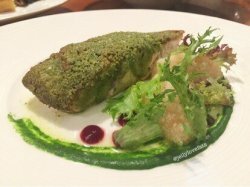 The Barramundi is pan-fried with a layer of herb crust and plated with tarragon puree and home-made beetroot gel. I am relatively neutral to this dish. Perhaps, I didn't like most of the ingredients except the fish. All thumbs up for the Wagyu Beef Burger ($24). 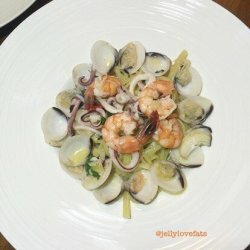 Even though this isn't a chef recommendation, we love this dish. The beef patty was juicy and they nailed it with a right amount of nacho cheese. Personally, I felt the burger would taste even better if they use (Red) Cheddar. And the fries worth a mention too, as we could taste the truffle flavour and it has an excellent crisp exterior and mushy potato inner. 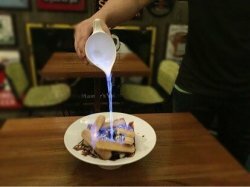 The Flaming Tiramisu ($16) is a alcoholic rich dessert. Great for those who love their alcohol. And we also tried the Passionfruit Creme Brulee ($14). 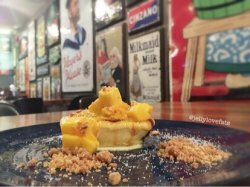 This dish isn't meant for diners who have low sour tastebud tolerance level. Otherwise, this is a great fruity dish which I find it with a good balance of sweet and sour taste and the almond crumbs added texture to the dish. And we would very much prefer if they use a sweeter mango. At Mr Punch Public House, since it is a gastropub, one is in for an alcoholic treat. They offered a range of cocktails. 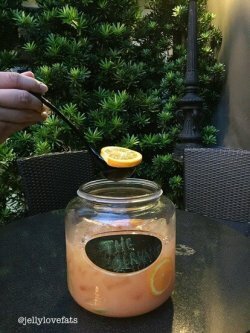 They have brought 15 worldwide famous cocktails onto their menu. The first we ordered was the Giderila ($28) hailed from the Mexico. The amount of drinks is equivalent to 2 servings in this portion. 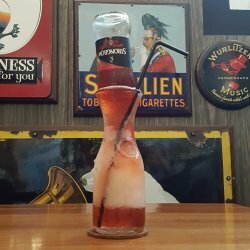 Next was the Jungle Bird ($17) from Kuala Lumpur. This is a bittersweet, strong in alcohol drink. If you hold your alcohol well, go for this. Other alcoholic drinks include Draught Beers, a range of Bottled Beers, Spirits, Wines by bottle or glass and Punch Jar. Coming to the non-alcoholic drinks, there are the soft drinks, juice, coffee, tea by pot and the highly recommended Owl's Brew ($12) in 3 flavours, Classic, Coco-lada and Pink & Black. We didn't try the Classic. The among the 2 we tried, we prefer the Coco-lada. 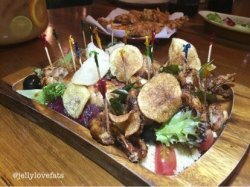 After having food at the basement and should you need more drinks and to chillax, diners could hit the rooftop bar. We thought Mr Punch Public House is great for gathering in groups of 4 and above, since the food are mainly for sharing. And the alcoholic drinks at Mr Punch Public House were solid. We could savour the strong alcohol.